One of our other pillars to our Hog Roast Chelmsford business, in addition to catering, is that we hire out and sell all of our hog roasting machines to members of the public and other caterers alike. We do this so that people can see for themselves that the art of hog roasting is really something to be admired and how having the right equipment really does go a long way in assisting you to achieve a perfect result. Whenever anyone enquires about purchasing a machine, just as Shirley did this week, the first thing we do is invite them to visit our showroom and factory in the heart of Lancashire where we build all of our machines and have the full Hog Roast Chelmsford range on display. The factory is also where anyone can drop in anytime for some advice about hog roasting or to get parts for their machine or even get it serviced if needs be. Shirley, was impressed with the diverse range of machines we had, having previously thought a hog roasting machine came in only one style. We showed her the different options and explained which Hog Roast Chelmsford machine best suits each purpose and also demonstrated the different attachments each machine can come with. As a local caterer herself Shirley thought she should get a machine large enough to cater for any number of guests but also one that she would be able to cook from by herself as she told us her business was often a one-woman operation. 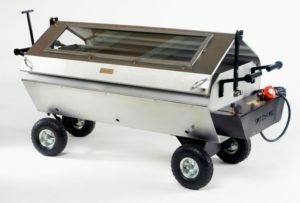 We suggested the Titan, our classic hog roasting machine known for its durability and robustness but also its ease of mobility thanks to the wheels and handles, which are fully removable if required for transportation. Shirley was blown away and said the Titan was just what she had in mind all along and put an order in there and then!